The use of terahertz (THz) waves for biosensing is currently receiving considerable attention. THz waves are able to detect molecular vibrations and rotations, without using labels that can affect the properties of the substances of interest. However, until now, the diffraction limit of THz waves and their strong absorption by water have constrained this technique. Microfluidic devices are also promising analytical systems because of the low sample volumes needed for sample measurement. 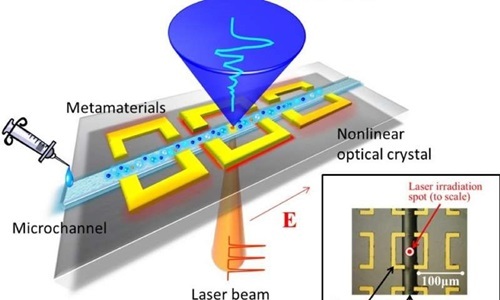 A group of researchers from Osaka University has now developed a nonlinear optical crystal (NLOC) chip, which combines THz waves with a microfluidic device, utilizing the close proximity of the THz wave source and the solution of interest in a microchannel. Their work was published in APL Photonics. 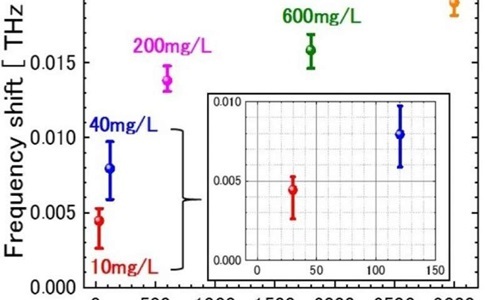 "Using our technique, we have been able to detect solution concentrations of several femtomoles in volumes of less than a nanoliter," corresponding author Masayoshi Tonouchi says. "Such high-sensitivity detection without the need for labelling moieties has great potential for future low-invasivity clinical techniques." Early and rapid detection of a number of common diseases is expected to be one of the major applications of the technique. Cancer, diabetes, and the influenza virus could potentially be detected with only very small volumes of bodily fluid, reducing the pain and discomfort of numerous exploratory procedures for patients. In addition, the technique allows living cells to be analyzed in a non-destructive way, which has numerous potential benefits in research. The developed NLOC chip is able to locally generate the THz radiation in close proximity to the single microchannel device, improving efficiency. The sensor chip was used to analyze mineral concentrations by comparing frequency shifts resulting from the presence of ions to those of pure water. Using this technique they determined a sensitivity of 31.8 femtomoles. "Achieving high sensitivity without the need for a high-power optical or THz source, near-field probes or prisms, opens up a number of possibilities," lead author Kazunori Serita says. "We are very excited about the potential of our findings to lead to rapid detection and compact device design. In particular, we see our results accelerating the development of THz lab-on-a-chip devices." This highly adaptable technology is likely to ripple out into many areas of analytical and biochemistry, as well as cell biology, and clinical medicine.